Breaking news from the Aeroflot open in Moscow. 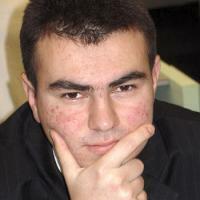 ChessVibes is reporting that top seed and no.18 ranked player in the world, Shakhryiar Mamedyarov (pictured) has withdrawn from the tournament after accusing leader Igor Kurnosov of cheating. Mamedyarov lost quickly to Kurnosov in round 6 and was unhappy at his opponent's behaviour which he believed was suspicious. On 22.09.2009 the game between myself and Igor Kurnosov was played. During the game my opponent went out of the playing hall after each move, took his coat and withdrew himself on the toilet. After suspicion of unfair play on move 14 I offered a draw, he refused. We quickly played 11 moves, on the 12th move I played a move which confused my opponent. The next moves from him were given as first choice by Rybka, which quickly allowed him to win the game. Due to this series of suspicions, having to do with the unusual behaviour of my opponent, Igor Kurnosov, I hereby lodge a protest and refuse to continue participation in the tournament. I hope that this kind of situation will not occur in the future.